Ruba Rombic, a unique pattern in that it was produced both in glass and pottery, was first made in 1928 by Consolidated Lamp and Glass Company. It was conceptualized by Reuben Haley who was a former vice president with United States Glass Company, according to the Phoenix and Consolidated Glass Collectors Club. Production of this Art Deco glass pattern continued through 1933. Some pieces were marked with foil labels reading “Ruba Rombic An Epic in Modern Art” when they were new. There have been 37 different objects in this cubist glass pattern documented including bowls in varying sizes, vases, cream and sugar sets, decanters, plates, and divided serving dishes. All Ruba Rombic glass was made by Consolidated Lamp and Glass Company with the exception of the rarely found fish bowl with metal stand. It was produced by Phoenix Glass Company. This lot of five “table articles,” as described in an auction catalog, consists of a divided dish measuring 7 3/4-inches, creamer and sugar set, and two small bowls. All pieces are made in the smoky topaz color, one of the most common Ruba Rombic hues. They are described as having “very minor and typical flaking” common to this angular glassware pattern. The lot sold for $316.25 (not including buyer’s premium) at Morphy Auctions in December of 2010. Such a limited amount of Ruba Rombic glassware exists that it is all considered hard to find. However, the most commonly found colors are smoky topaz and jungle green. In addition to those more common hues, Florence’s Glassware Pattern Identification Guide by Gene Florence indicates that Ruba Rombic glass was made in the following colors: French crystal, silver gray, lilac, sunshine, jade, milk glass, apple green, black, and French opalescent. Due to its rarity and demand for these pieces among both glassware and Art Deco collectors, Ruba Rombic is one type of glass that maintains its value even when minor damage is present. In fact, due to its angular shape, it is even harder to locate in mint or near-mint condition when compared to other glass made during the Depression era. The most affordable pieces are shot glasses and smaller plates in smoky topaz or jungle green, which can usually be found for under $150 each when the shot glasses are part of a complete whiskey set including a decanter and tray, the price rises. Collectors feel lucky to find a set of this nature in the $6,000 range. Other colors are exponentially more valuable. The 15" decanter on the left is sometimes sold for tidy sums as an "extremely rare" piece of glassware. The truth is that most sellers who think this is Ruba Rombic have been misinformed. These bath salt bottles have actually been found with paper labels that read Made in Yugoslavia, and they date to the 1960s. The color mimics Ruba Rombic's jungle green, but the glass has mold lines that would not be present in an original piece along with a hollow stopper. According to a "Collector's Weekly" article, all Ruba Rombic stoppers are made of solid glass. While not technically a reproduction, this piece does cause confusion nonetheless. On the right is an authentic Ruba Rombic vase in jungle green made between 1928 and 1933. In spite of a minor rim flake to the glass, the 6 ¼-inch vase sold for $517.50 (not including buyer’s premium) at Morphy Auctions in December of 2010. Ruba Rombic, first produced in 1929, is one of the most popular and highly valued lines made by Muncie Clay Products Company (reorganized as Muncie Potteries in 1931). 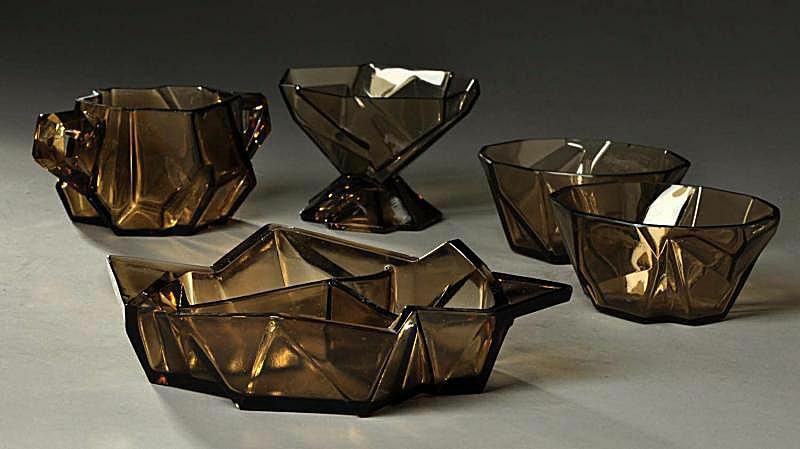 Like the glass counterparts made by Consolidated Lamp and Glass Company, these were designed by Reuben Haley who had previously worked as a vice president for United States Glass Company. Other motifs he designed for Muncie include the well-known Spanish line, Katydid, Lovebirds and Tropical Fish, according to Jack Wilson, author of Phoenix and Consolidated Art Glass: 1926-1980 (now out of print). The central piece in this photo is a Ruba Rombic lamp base. It is flanked by two Muncie Katydid pillow vases. All three pieces have “minor manufacturing flaws” as described in an auction catalog. The condition is very good to excellent — the lot of three pieces sold for $373.75 (not including buyer’s premium) in January of 2011. What Is Art Deco Style?